I haven’t posted in a while, but I sure have learned a lot in the one hour of quiet time I’ve etched out for myself within my day. I have journalled and read a lot, it’s been a cathartic process. It occurred to me today that after going through this year, I have no other choice than to drop the mask I’ve worn for years and stand in my truth. I am drawn to other mask-smashers/truth-standers. The ones who admit their faults, are brave enough to live out loud, vulnerable to admit they are struggling and don’t have the answers, and humble enough to seek help. Divine intervention…I understand that term in my way now. These special people carry a certain energy within how they relate to others and how much they give and receive. I have learned they come in all ages. Some figure it out at an early age, and others like myself, take more time. But it is undeniable when I meet one. We can quickly connect and relate to one another’s struggles even if they differ. They no longer seek validation from the outside world. They are not afraid to sit within their pain, understanding the necessity for it. Not to say it’s easy. It’s the hardest thing I’ve ever done. No more numbing it or masking it with anything. I’ve become defiant within my right to feel whatever feeling comes my way through this process. I was once afraid to feel anger, loneliness, weakness. You have to feel that to rebuild an authentic strength. I own my pain. I welcome it in and nurture it like my child. It is mine to learn from and grow within it. And I know God loves me just as I am, in whatever stage of broken humbleness I am. Come as you are. 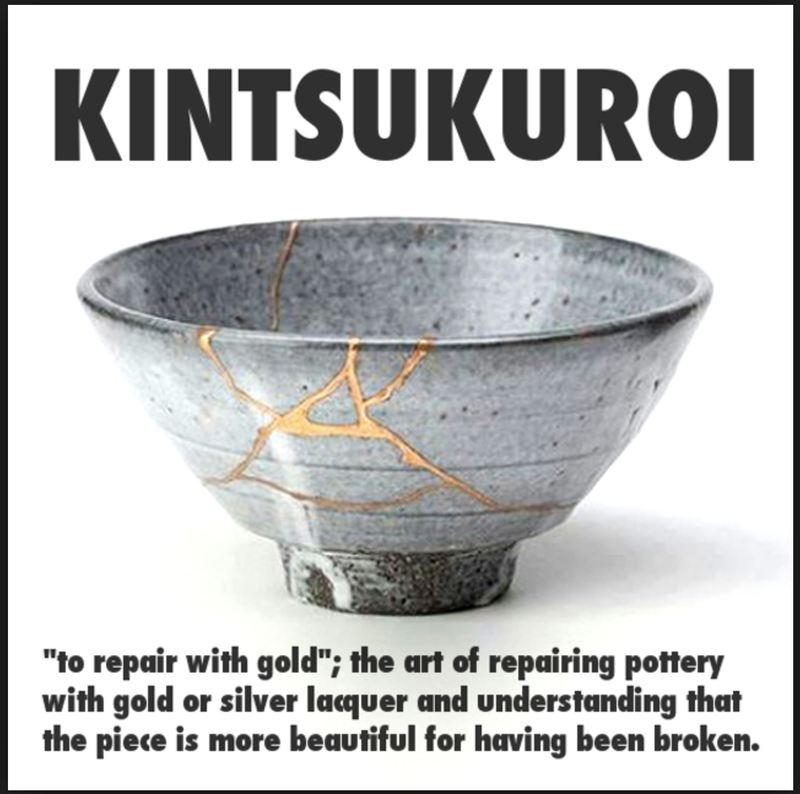 Kintsugi (金継ぎ?, きんつぎ, “golden joinery”), also known as Kintsukuroi (金繕い?, きんつくろい, “golden repair”), is the Japanese art of repairing broken pottery with lacquer dusted or mixed with powdered gold, silver, or platinum, a method similar to the maki-e technique. As a philosophy, it treats breakage and repair as part of the history of an object, rather than something to disguise. This process of transforming broken into beautiful really resonated with my heart. Pride has often gotten in my way, but I’m learning a new version of pride. The one that arrives softly and humbly as I understand the process of letting go and starting over from the bare foundation. I will let tears flow freely if they arrive, I will laugh often as I appreciate the sweet irony of this beautiful life, I will embrace change as I understand it is necessary, and I will walk the path of alone because I know I am never truly alone because of my faith and the blessings within relationships I have come to honour and respect deeply. I have a voice, even if it is unsure and full of self-doubt at times. It will grow in strength if I build upon it, just as I know how to do in the physical body. I am not failing just because I am not where I “expected” to be at this stage. Maybe I’m exactly where I need to be. Humble and hungry for knowledge. I can see pain within others, especially the ones who aren’t ready to feel it. Who are running from it, numbing it with external factors. Clinging to their masks like life-preservers. If this is you, I want you to know that you will not drown. Quite the opposite. You will rise up within authenticity. Be brave my friends. You’ll be OK. You are more beautiful for being broken. For years I never allowed myself to feel hunger, or pain or anger for that matter. I feared and pushed away the very elements where I would find myself again. As I let go of material possessions, relationships, the ability to control my environment…even time. I found my strength and awakened a part of me I lost.